Dominate high traffic corridiors. 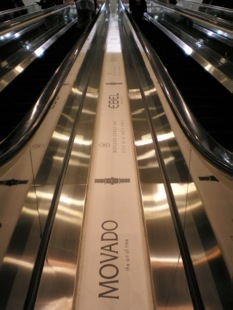 Informational Escalator Advertisements are strategically placed on escalator medians. Advertisers' sales messages progress as guests travel up and down these high-volume corridors. All escalator printing specs include 3M non-residue output, sample available upon request. Pricing includes printing, installation and removal. 3D Media Provides: Turnkey Activation, Production, Installation & Measured Performance.